Click the image above to get more information and register for this exciting event! The One Stroke Reunion to Remember - come see your painting friends from the early days. Renew friendships, make new ones, learn what's new and exciting this year. New this year - meals included, evening events including fashion show, painted piece competition and awards cermony. (see link above for details) Don't be the left out - find out the latest in the world of One Stroke, wOils and PenDezigns by Donna!!! Click on the picture left to find out more about the 2014 Workshops Donna is teaching around the country!! Sign up today! 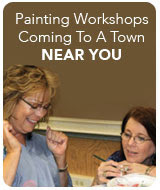 Come on out and PAINT with Donna! New Techniques, New Projects, Fellowship and FUN with other One Stroke painters!